Improving the external look of your home can make a massive difference to your property’s appeal and will prove a huge factor if you come to sell-up in the future. But this can be a great hassle for many homeowners, especially in large properties. You’ll need ladders and scaffolding to scale your home and it’ll be extremely time consuming to paint the whole exterior. 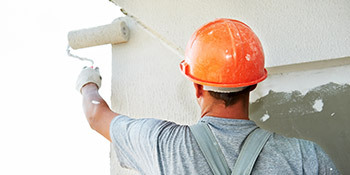 This is where exterior painters and decorators come in handy. Under your direction they’ll improve your home’s appearance, raising the aesthetic appeal and possibly its value too. The exterior look of our homes will deteriorate over the years and to keep properties in tip-top condition you’ll need to have it repainted every few years. Not only will it increase the aesthetic appeal, but redecorating will provide further protection from the elements. Exterior painting brings a wealth of benefits to your home, not just in the look but also in the protection of your property. If you’re interested in freshening things up, complete our quick form and receive up to four FREE quotes from our database of vetted, reputable painters and decorators in your area. This will help you receive competitive painter and decorator rates and ensure you pay out the right price. Project: Looking for someone to fill and paint interior walls, skorting boards, ceilings and banisters of a 4 bedroom house. Possibly some plastering too. Project: To pain t front, side and back of detached house, rendering required on all 3 walls, front porch and small window at side of house. Excellent service and the price quoted was the price paid. Good response pleasant in consultation. Helped to put us in touch with a very good and competitive company. Found two painters I was not aware of but different issues with both so no booking made yet. I received a competitive quote very quickly and the work was done to my satisfaction within 48 hours. The below data displays the energy performance of properties in Uk. Energy ratings vary from A to G, with A being the most energy-efficient and G being the very least efficient. The Energy Performance Certificate (EPC) rating comes into play heavily if you want to sell your home, as potential buyers will see what amount they're probably going to be paying for their heating expenses. House improvements including insulation help you to significantly boost a home's EPC rating. The data below shows the numerous types of houses within Uk. By far the most commonplace houses across the United Kingdom are detached and semi-detached homes. Other kinds of properties consist of terraced houses, flats, converted flats and bungalows. The pie chart below reveals the portion of homes in Uk that are central heated and non-central heated. Central heating figures within the vast majority of UK houses, which includes those on the gas grid and properties heated by oil and electric. The data beneath shows the spread of properties heated up by different fuels. Around the UK the most common by far and away are gas heated properties, followed by electricity and then oil. Biomass central heating boilers are also rising in popularity, heated by environment friendly products like wood pellets or agricultural waste.|Properties in the UK are warmed by a range of fuels, which include gas, electricity, oil, solid fuel and LPG boilers. Each fuel has a varying cost associated with it and that means you can find yourself with more affordable energy bills by switching how your house is heated. Even solar thermal panels are being considered by many people in order to reduce heating bills for the years to come.